The ADJ COB Cannon Wash Pearl uses advanced RGBA COB (Chip On Board) technology allowing for a powerful LED engine to be placed in a small amount of space. The result is a high output, smooth color-mixing LED Par with no RGBA shadows. 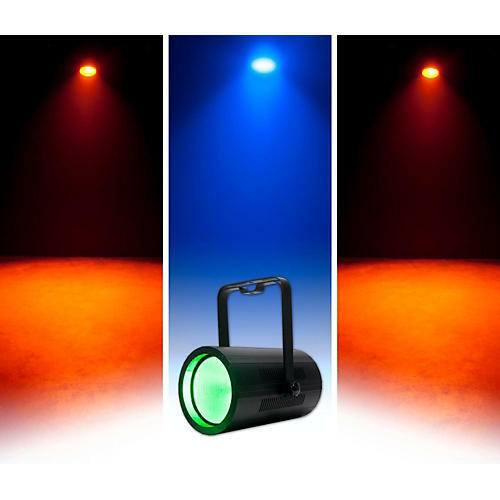 Designed for mobile or permanent wash lighting of stages, clubs, dance floors and churches. The COB LED engine on the COB Cannon Wash Pearl is a QUAD RGBA 4-In-1). It also doubles as an uplight with a dual yoke that acts as legs to set the fixture upright to wash walls and ceilings. The COB Cannon Wash Pearl comes in an off-white casing and has a massive 80-degree beam angle. Easily replaceable 40-degree and 50-degree lenses are included so that the beam angle may be changed. It has 7 DMX Channel modes for programming flexibility, built-in color macros and 5 selectable Dim Curves. The fixture has many pro features such as: 0-100% electronic dimming, strobe/pulse effect, Flicker Free operation, DMX and PowerCon power daisy chaining, and a 4-button DMX display. COB Cannon Wash Pearl may run in stand-alone mode from built-in programs, sound actively or from a DMX controller.